President Obama’s senior adviser challenges graduates to find their purpose and passion. 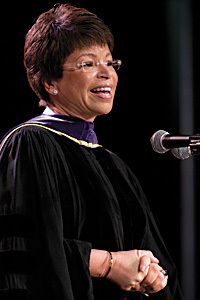 From the inner circle of a history-making White House, Valerie Jarrett came to Madison Square Garden on May 14 to tell more than 1,000 members of the Class of 2010 that they will encounter uncertainty and setbacks, but “if you lean in and tackle adversity with creativity and innovation…you will have the potential to create an insurmountable force to help lead our country to a brighter day.” Interweaving the personal and the political, Jarrett chronicled her own “circuitous career,” which took her from the University of Michigan Law School in 1981 to her current position as a senior adviser to President Barack Obama and assistant to the president for intergovernmental affairs and public engagement. The buoyant ceremonies were tempered by the terrible loss of two members of the graduating class who were honored during the ceremonies. Lucas Johnson died on April 30 after a valiant battle with cancer; Mattei Radu passed away on May 7 due to complications from asthma and a previously undiagnosed heart condition. Their classmates dedicated the Class of 2010 Graduation Gift to them. Totaling more than $100,000, it was presented by Sabrina Ursaner ’10 and Aleksandra Krawcewicz (LL.M. ’10). In addition, Johnson, who had completed five semesters, was declared an honorary member of the Class of 2010. Luc Radu accepted an LL.M. degree on his brother’s behalf.